Recently, we took a day trip to Mount Fuji from Tokyo. As it’s about 100 kilometers from Tokyo, it’s fun and fairly easy to plan a day trip to Mount Fuji from Tokyo! While we were in Japan we didn’t want to miss a visit to this perfect painting-like mountain! So, we decided to pay a visit to Lake Kawaguchiko. There we had a lovely sunny day walking around this amazing town with Mount Fuji as backdrop. We also decided to go to the Lake Saiko and Chureito Pagoda for another iconic view of the mountain. In this article we share various information for your day trip to Mount Fuji. For instance, information about visiting Lake Kawaguchiko, Lake Saiko and the Chureito Pagoda. 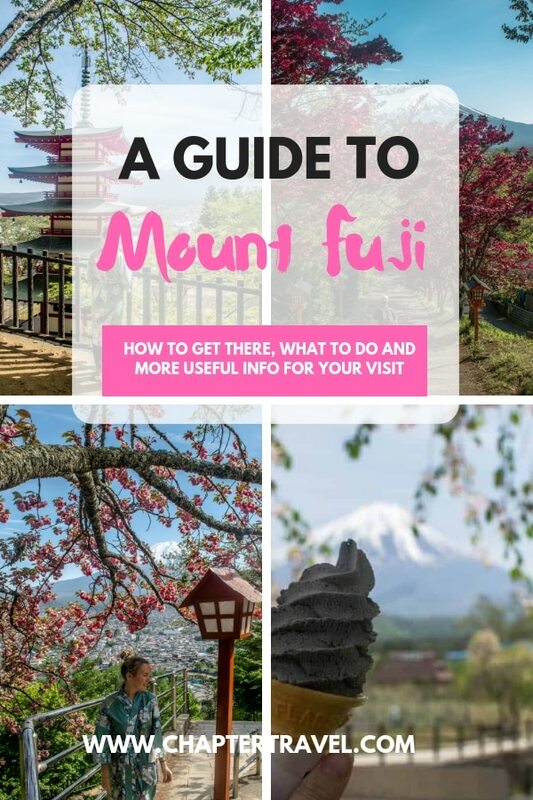 Furthermore, we explain how to get to Mount Fuji and how to travel around. We also share our own Mount Fuji Day trip itinerary. Lastly, we share some brief information about climbing Mount Fuji, which we did not do ourselves (because we were way to lazy for that). Mount Fuji is the highest mountain in Japan and one of the country’s iconic landmarks. It’s not a surprise that it’s also a Cultural Site on the UNESCO’S World Heritage List. In Japanese the mountain is called Fuji-san (富士山) and it’s considered to be a sacred place. We understand you’re mostly interested in seeing this beautiful sacred place! So, where can you actually see Mount Fuji? Please be aware that it’s not always possible to see Mount Fuji due to clouds and low visibility. In this article you can find some tips to increase your chances of having a good view of the sacred mountain. We were very lucky and had a clear blue sky during our visit, and we could see the mountain very, very clearly. Not trying to brag or anything. There are five lakes around Mount Fuji, namely Lake Kawaguchiko, Lake Yamanaka, Lake Saiko, Lake Motosu and Lake Shoji. We decided to go to Lake Kawaguchiko, Lake Saiko and the beautiful Chureito Pagoda. We definitely recommend visiting Lake Kawaguchiko and Lake Saiko, as both lakes offer multiple wonderful views of Mount Fuji. Of course it’s also possible to visit one of the other three lakes during your visit, and we have heard they have some excellent views too. If you’re planning on a day trip and seeing Mount Fuji from multiple lakes, plan your time wisely! Chureito Pagoda is also worth a visit, as from here you’ll get the famous view with the temple and Mount Fuji in the background. Not sure how to travel to Mount Fuji? We suggest to travel to Lake Kawaguchiko. Lake Kawaguchiko is an excellent place to go if you want to have a great view of Mount Fuji. It’s quite easy to get from Tokyo to Lake Kawaguchiko, and you can do so by bus and train. We decided to travel by bus from the Shinjuki Station, and we left around 8 am. If you’re only going for a day trip like us, we recommend going early to get the most out of your day! It’s possible to get your bus tickets online or at the ticket office at the Shinjuki Station. We paid around 30 euro a person for a return ticket. Please be aware that prices can vary over time. When you get your bus tickets, you already need to state the times you’ll leave from Tokyo and when you return from Lake Kawaguchiko. So it’s a good idea to have a rough plan on what you’ll want to see. The time our bus left from Lake Kawaguchiko was around 6 pm. So we were at Mount Fuji from approximately 10 am to 6 pm. We had enough time for traveling around Lake Kawaguchiko, Lake Saiko and going to Chureito Pagoda. Once we were at Lake Kawaguchiko, we bought tickets for the hop on, hop off bus. It’s also possible to book a scenic bus tour from Tokyo to Mount Fuji up front! 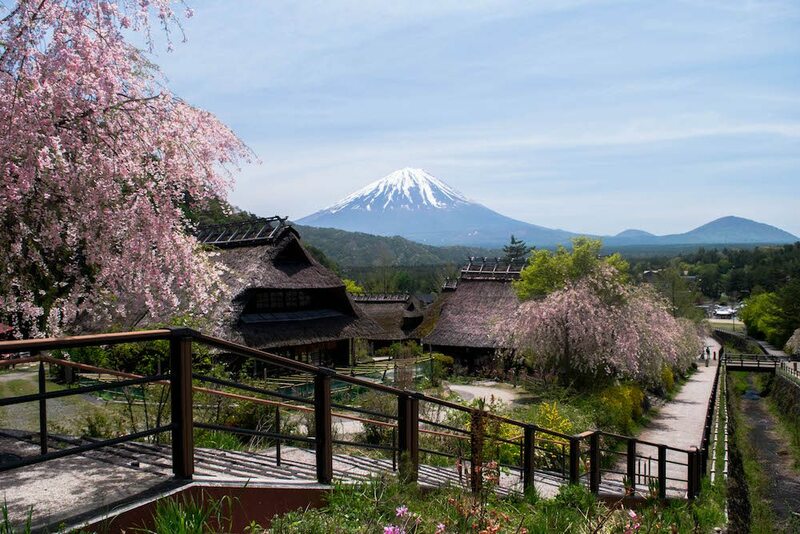 It includes a Japanese-style lunch, of course brings you to the best places around Mount Fuji and more. Check prices and availability here. In Kawaguchiko you can travel around town by bus. Once we arrived at the Kawaguchiko station we bought a day ticket and with that ticket we could use the Kawaguchiko Line and the Saiko Line. The Kawaguchiko line runs along the eastern and northern shores of Lake Kawaguchiko, while the Saiko Line runs along the southern shore and Lake Saiko. These day tickets can be bought at the station and cost about 10 euro each. If you want to travel to the Chureito Pagoda you can take the train. It’s also possible to get a rental car or a rental bicycle! We think it’s not really necessary as the public transport was quite easy and fast. We also decided to go to Chureito Pagoda from Lake Kawaguchiko. Unfortunately the bus lines we had tickets for didn’t go there. Therefore we decided to take the train from Kawaguchiko station to Shimoyoshida station, which takes approximately ten minutes and cost 3 euros per ticket. From there it is really easy to walk to the Chureito Pagoda. There are indications on the road that guide you to the pagoda. Of course, there are also plenty of things to do at Mount Fuji! During our visit at Mount Fuji we mostly took the bus or walked around and enjoyed the scenery. Everywhere we went we had Mount Fuji as backdrop and we basically didn’t stop taking photos. Next to the Chureito Pagoda, we visited Iyashi no Sato, which is the site of a former village on the western shores of Lake Saiko. They reconstructed the traditional houses with the thatched roofs and now it’s an open museum. It’s a beautiful peaceful place, and we walked around here and had some ice cream. It is also possible to buy local handicrafts here and learn more about the Japanese culture. Furthermore, you can also go to the Fuji Shibazakura Festival, which is a beautiful flower festival. This takes place between April and May. We wish we had the time to visit! There supposed to be a lot of beautiful hotels at Mount Fuji, so if you have the time be sure to stay a night. Also, why not stay at a hotel with an onsen? 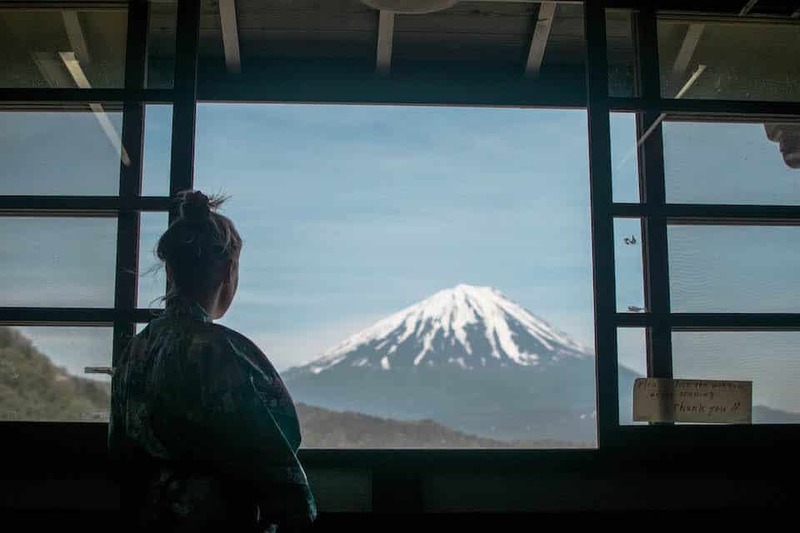 An onsen is a traditional Japanese bath, and there are many great places where you can enjoy these baths with a view of Mount Fuji. We wish we had time to do this! If you’re thinking of booking a day trip upfront, you can do so at various online booking agencies. For instance, at Get Your Guide. Book your Mount Fuji Day Trip here. Or perhaps you want to do a day trip without a tour! If you want have a DIY trip to Mount Fuji, without a tour, we completely understand. We did so too and only booked bus tickets. If you’re looking for a day trip itinerary for Mount Fuji, you came to the right place! 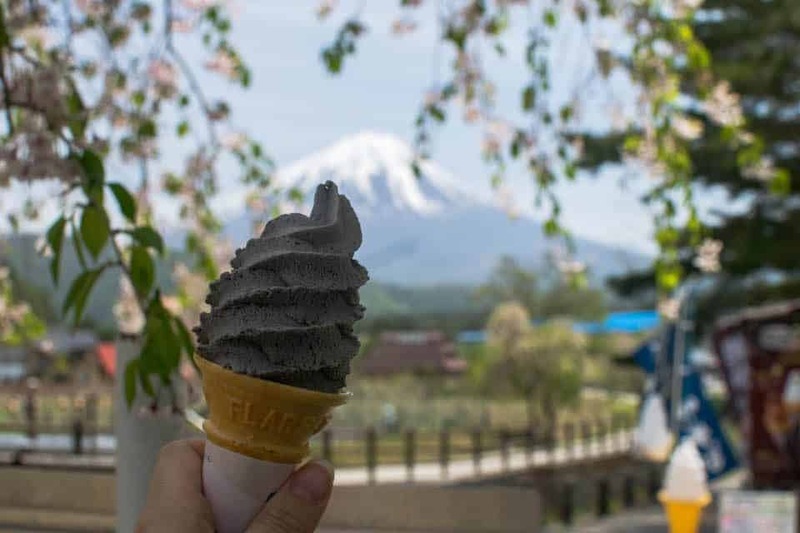 As we had such a lovely day in Mount Fuji, we decided to share our day trip itinerary with you! It can be useful if you’re not sure what you want to do. The following times are an estimation, we didn’t check our watches all the time. We took the bus from Shinjuki Station around 8 am. You can get your tickets online or at the Shinjuki Station. Once we arrived at Lake Kawaguchiko we bought bus tickets to travel around Lake Kawaguchiko and Lake Saiko. We also got a map of the two lakes so we can see where we can stop to take photos! First we went to Lake Saiko to visit the Iyashi no Sato. We walked around Iyashi no Sato, which is a reconstructed open air museum of a traditional farming village where you can learn about the culture and try out and buy various local handicrafts. We ate some ice cream here and continued our day trip! Of course, we took way too many photos of Mount Fuji. 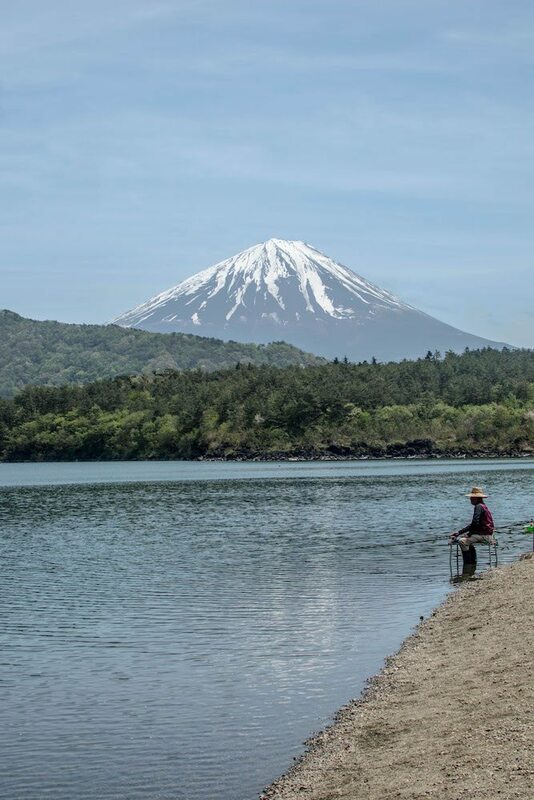 When we walked back to the bus we saw a man fishing, it was such a peaceful sight with Fuji as backdrop! The bus around Mount Fuji is probably the best bus ride you can take! We took the bus back to the station at Lake Kawaguchiko, because here you can also catch the train to the Chureito Pagoda. In between we got out of the bus a few times to take photos of the amazing views. Time to have some lunch to fuel up. By now we were pretty tired already, so it’s good to sit down and eat some food. Check out these 10 best restaurants near Lake Kawaguchiko to get some inspiration where to eat! We took the train to Chureito Pagoda! The station you need to get to is the Shimoyoshida Station. It’s only about 3 euros for a return ticket and takes about 10 – 15 minutes. Once you arrive at Shimoyoshida Station, follow the signs to Arakura Sengen Shrine, which is where you’ll find the Chureito Pagoda. Eventually you’ll see a mountain on which the Pagoda is located. It’s about 400 steps up. 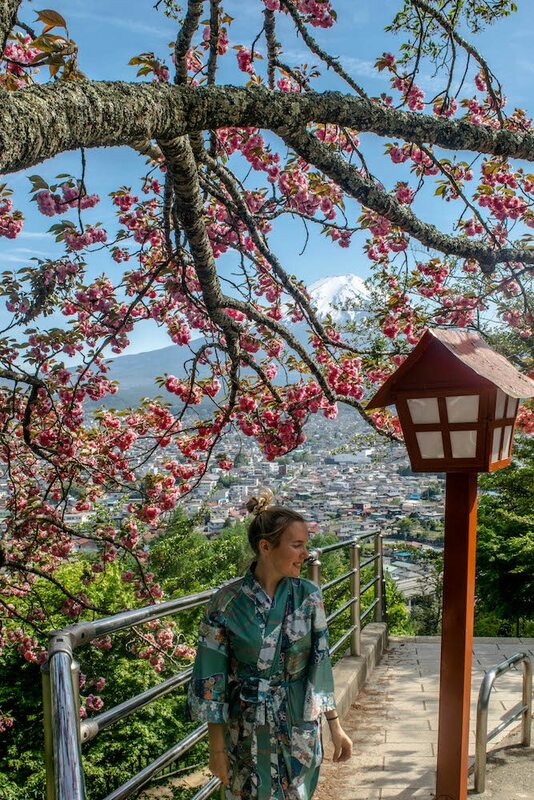 It’s a beautiful walk up and you’ll have amazing views of Mount Fuji! 13.45 Enjoy the view from Chureito Pagoda! We stayed quite some time at the Pagoda, it’s absolutely beautiful. I wish we were there during the cherry blossom season! We took the train back to Lake Kawaguchiko. We still have enough time to explore Kawaguchiko Town, which is a picturesque town next to the famous lake with the same name. We bought various gifts from Mount Fuji in the gift shop. You can find it at the bus and train station at Kawaguchiko, so that you’re in time for the bus back to Tokyo! Time to go back to Tokyo! It’s been a busy, but wonderful day. It’s possible to climb Mount Fuji, but we would recommend to take at least two days for it. The official season to climb the mountain is between July and September, as the weather is a bit milder and the snow has melted. It’s also possible to climb the mountains off season, but be aware that it gets a lot colder and that if you’re not an experienced trekker it’s not recommended. Because it’s a sacred mountain people make pilgrimages to the top. Meaning it can get pretty busy, it’s even often dubbed as the most climbed peaks in the world. There are also a lot of foreign tourists that climb Mount Fuji and about 30% of the trekkers are not Japanese. There are various trails to climb Mount Fuji: Yoshida Trail, Subashiri Trail, Gotemba Trail and the Fujinomiya Trail. Overall, it’s supposedly not a very difficult hike. However, it can take quite a long time, so it is not necessarily recommended to do it in a single day. Click this link to read more about the trails, duration of the hike and other relevant information. Have an amazing time at Mount Fuji! Let us know in the comments if you have any questions. Disclaimer: This post may contain affiliate links., which means we earn a commission (at no extra cost to you) if you purchase something with our link. Please read our disclosure for more information. Thank you! Thank you very much for this informative post! We hope to see Mt. Fuji in a clear day soon. This is such a helpful guide! When I was in Japan, I really wanted to go to Mount Fuji, but me and my family got so overwhelmed by all of the Japanese characters we couldn’t read (fun fact: I took Japanese in school, but they primarily taught us hiragana and katakana, so that wasn’t super helpful since almost everything was kanji lol). Next time I’ll use this guide to get me there! Great tips! Can’t wait to visit Japan and especially Mount Fuji one day. I hope I’ll be lucky enough to be there on a clear day. Thanks for all the tips! Lovely post! Japan is very high on my list. The mount Fiji is iconic and stunning. I can’t take my eyes off it whenever I see it in pictures or images. I didn’t know that one can’t always see the mountain. But it kinda makes sense since way high up. These are beautiful pics! I went to Tokyo a while ago with my mum. We climbed Mt Takao and could also see Mt Fuji in the background ( a bit far away yet clearly visible). I kind of wished we would’ve done Mt Fuji as well. At least there’s something left for the next time now. 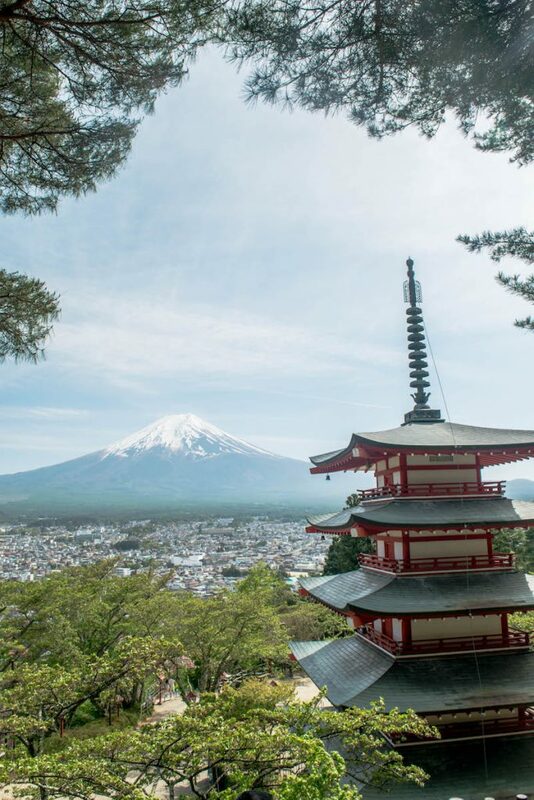 Ooh I always wondered where is that viewpoint to get the classic shot of Mt Fuji with that gorgeous Pagoda! Now I know! Lake Kawaguchiko sounds wonderful. I would love to stay at an onsen ryokan there. Wonderful photos! So informative, saved it, seems you had a great time exploring Fiji and the surroundings . Love the kimono pics. 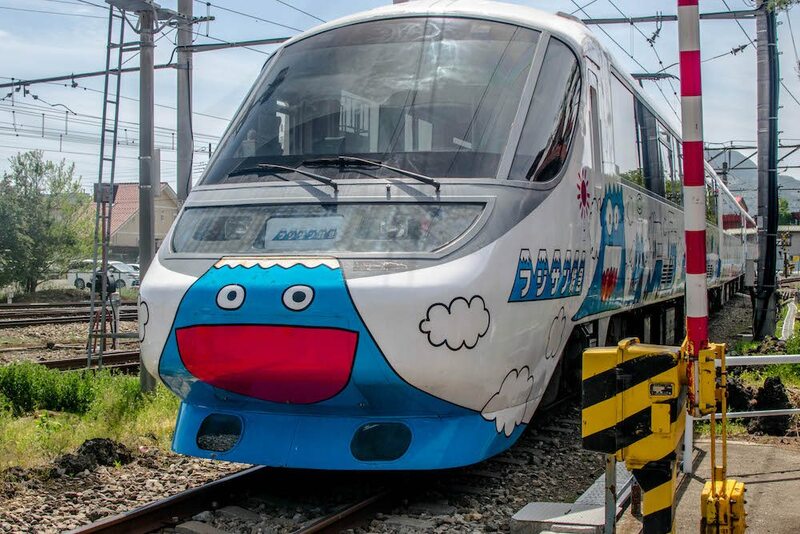 The bullet train looks so funny so eager to ride one! I’ve been to Japan so many times but the only time I’ve seen Mt. Fuji is from afar o the bullet train! Thanks for this handy guide, I definitely need to go next time I’m in Japan! I’m heading to Tokyo in a few weeks, but I don’t think I’m going to have time to squeeze in a trip to Mount Fuji. I’m so sad, but I’d love to go back and hike it some day. Is the picture with the town in backdrop (brown lamp post on the right) at Chureito Pagoda? Lovely and detailed article! Been to japan countless times, but didn’t know there was a bus. ALways took the train, etc. This place is definitely on my wish list!! Love this post!! The first time I tried to visit Mount Fuji, I got my schedule mixed up and ended up leaving Malaysia a day late. By the time I got to my hotel in Tokyo, I had missed the bus. A few days later I went to Mount Fuji. You have captured it well here. My tour also include a visit to a temple with a view and a cruise on Lake Ashi. What a beautiful day that I would re-live in a heartbeat. Thanks for your comment Anne! The cruise sounds amazing. We loved our day at Mount Fuji too and would love to go again.